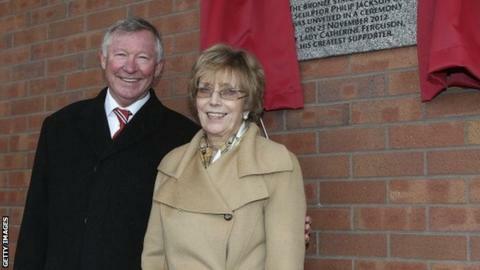 Sir Alex Ferguson says he would have continued as Manchester United manager had it not been for the death of his wife's twin sister. Ferguson, 73, retired in 2013 after winning his 13th Premier League title. United have struggled since, sacking successor David Moyes after 10 months and failing to win a trophy. The death of Cathy Ferguson's twin Bridget in 2012 was the catalyst for change. "I definitely would have carried on," the Scot told the Daily Telegraph. Cathy Ferguson talked her husband out of retiring in 2002. "But this time when I told her I was going to retire she had no objection," Ferguson said. "I knew she wanted me to do it." Despite winning the league by 11 points in his final season, United failed to qualify for Europe in the following campaign, with Moyes' exit being confirmed once it was certain they would not secure a place in the Champions League. The reversal in fortunes was a surprise to Ferguson. "Even when I knew I was retiring we still tried to put some things in place, with players coming in," he said. "The bus was still moving forward. Everyone was optimistic about where we were going." Ferguson is about to launch a new book on the art of management, drawing on the experiences he gained working with some of the most famous names in the game, including Real Madrid forward Cristiano Ronaldo who was at United from 2003 to 2009. "Dealing with an ego doesn't bother me," he said. "You used to see Ronaldo standing in front of the mirror loving himself. "But it was a nice vanity. The players used to throw jockstraps, boots and all sorts at him."